Want to try some new teas? 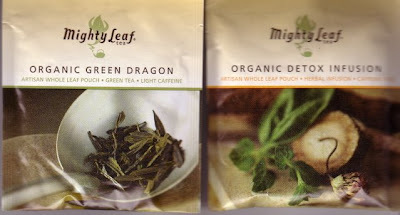 Have you ever heard of Mighty Leaf Tea? I first learned of it when my sister gave me some for Christmas several years ago. These were the first silken teabags I'd ever come across, and I was (and am) quite impressed with their design and especially their flavor. Mighty Leaf has just sent two samples each of two new flavors. They include Organic Green Dragon ("delicately pan-fired, these smooth highest-grade China Longjing green tea leaves brew a nutty and buttery cup") and Organic Detox Infusion ("a luscious detoxifying herbal infusion highlighted by clean notes of mint and basil. A spa retreat in a cup.") 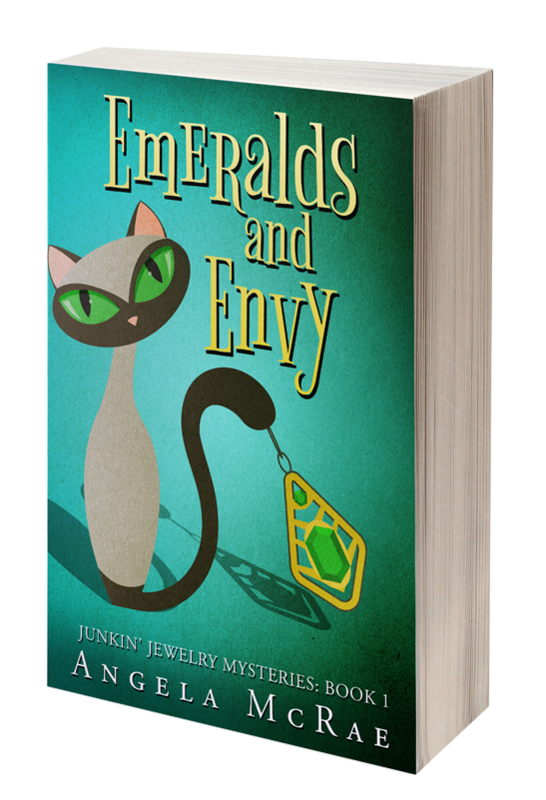 I'd love to share two of the samples with a reader of this blog. So, anyone who comments today and says "count me in," or something to that effect, will be eligible to win this mini-giveaway, which *might* include another goodie or two as well. And if you're the winner, would you kindly e-mail me your thoughts on the new teas, good or bad? Then I'll post both of our reviews of the new flavors. If there's interest, maybe we'll even make this a regular feature! Few of the photos in the box were identified or dated, but the ones that were indicated they were taken in the 1920s, so I'm guessing that's the age of this photo as well. In the photo above you can see the cardboard matte surrounding the photo. 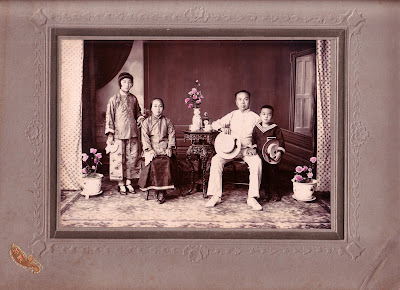 In the lower left corner, it is embossed with the name Yim Fong Sun Chang. As I watched the back-and-forth bickering in Washington over the bailout package last night, I couldn't help thinking one of my no-nonsense mommy friends needs to step in, tell the children to go to their room, and don't come out until the two of you have decided to get along. I don't want to hear who started it or whose fault it is; just make it right. Last night the politicians all made me so ill that I decided to go punch some ... tags! And I used these two punches, which are some Old Faithful craft supplies from my stash. 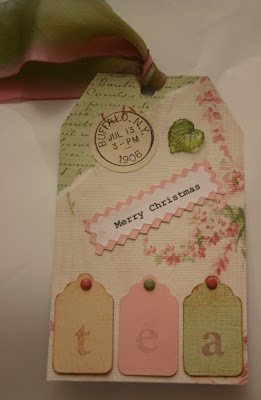 The Multi Tags Scallop Punch is from McGill Craftivity, and I've made many a tag with this thing. 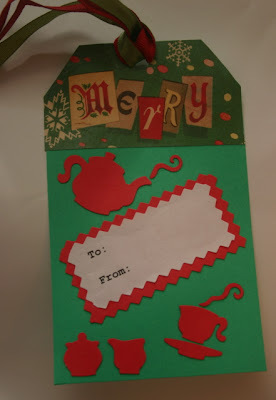 Here, I made a 3x5-inch Christmas package tag that spells "TEA" and will no doubt be used on a gift for one of my many tea friends this Christmas. 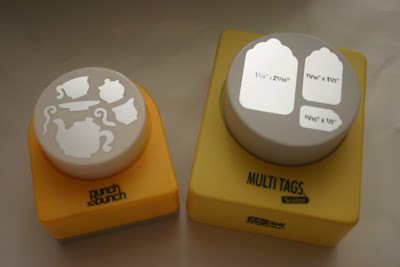 The second tag uses cutouts made with a punch from Punch Bunch. 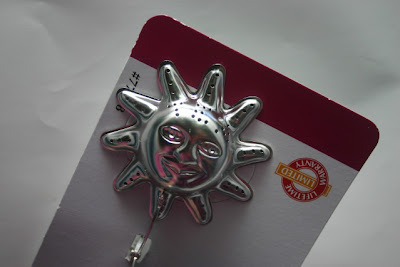 I bought this at a scrapbooking store years ago for $14, as I recall. It seemed expensive at the time for a simple punch, but I have used this thing so many, many times since then that I've certainly gotten my money's worth out of it. 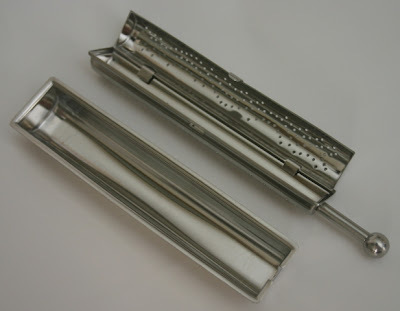 I've used it to make greeting cards, and I've also punched out just the teapot and used it on placecards at tea parties. One thing I love about making these tags is that I already own everything needed to make them (papers, brads, ribbons), so I am actually being crafty and thrifty all at the same time. Now, let's see ... is there anything else I need to go punch? A different type of "Sun Tea"
"Sun" with "Tea" on top. Sun Tea? OK, maybe not, but the idea is still intriguing. 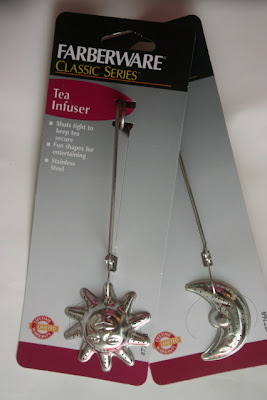 These two Farberware tea infusers were at my local Publix the other day for $2.99 each. I was surprised to see two new tea infuser designs and also to see them for such a good price, not the $5-10 I'd expect these to sell for at a gift shop. Do you like long books? I don't. And so it's rather out of character for me that the last two books I've read were both 500-plus pagers. 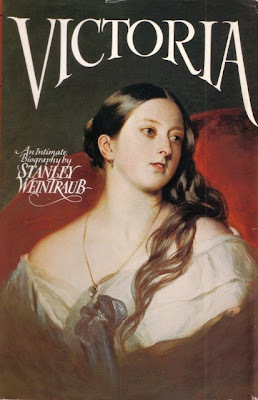 The first was the novel "New England White" by Stephen Carter (a bit of a political thriller, it was OK but not as good as his "Emperor of Ocean Park"), and the second, which could hardly be more different, was the 1987 book "Victoria: An Intimate Biography" by Stanley Weintraub (643 pages, thank you very much). Although I certainly learned a great deal of new information about the good queen, the parts I most enjoyed seemed to concern the many other famous faces with whom she came in contact. Felix Mendelssohn, whose "Wedding March" we know so well, was treated to tea with Victoria and Albert at Buckingham Palace during a visit in 1842. History comes alive in a great way when you read it unfolding as if it's a novel. * Victoria's trusted servant after her husband's death, John Brown, made the best cup of tea she had ever drunk, she told him. "Well, it should be, Ma'am. I put a grand nip o' whisky in it," Brown said. 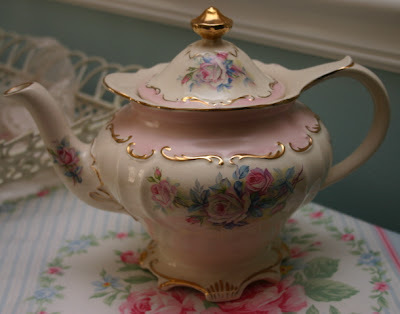 * When the Shah of Persia visited in 1873, Victoria gave a luncheon in his honor and pretended not to notice that he was drinking water out of the spout of a teapot. * At a Buckingham Palace garden party for 5,000 guests in 1893, Victoria had her own private "tea tent" where guests were received. My interest in the book was greater at beginning and end -- it was a longggg book -- but now I have a fuller picture of Victoria's life and gleaned a lot of wonderful British history in the process. If you like history and thick reads, you might want to look for a copy at your favorite library or used book source. After a productive afternoon of shopping while on vacation last week, I got back and began unwrapping all my goodies to show DH. 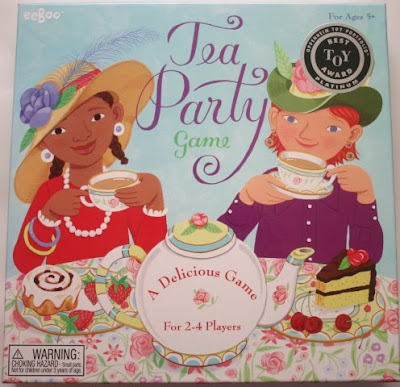 When I pulled out this Tea Party Game I found in an art supply store, he grinned and asked if I had gotten this as a gift for one of my nieces. "No, it's for me." (It says on the box it's "For Ages 5+" and I clearly qualify.) But alas, DH was not inclined to play, so I'll be taking this game on the road this weekend and hopefully my nieces will agree to play it with me. As a child, I always liked games with those "spinner" boards. 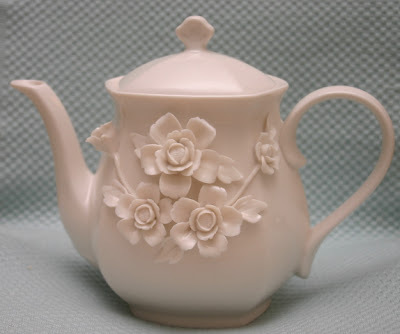 This one, in the shape of a teapot, is just too adorable. The game also comes with a real fabric tablecloth (child-sized). 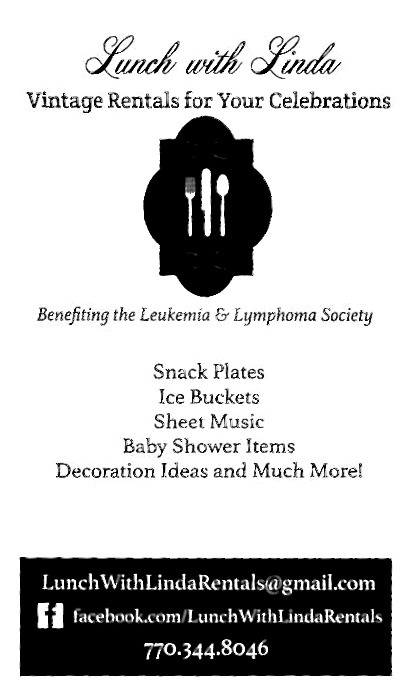 The general idea is to spin and collect all the pieces in a place setting, but you lose a piece of your place setting if you happen to land on the bees. After spending last week on a writing project, some leisure reading, and a trip to the beach, I'm home and eager to get back to work (well, OK, that's a lie) and see what's been going on in my absence (that last part is true). I discovered a number of new teas while out and about, and I couldn't wait to tell you about some of them. 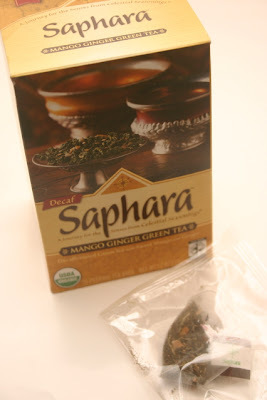 My greatest discovery was Saphara's Mango Ginger Green Tea, a new organic, Fair Trade line. For years I've been trying to find something merely approaching the divine flavor of Fortnum and Mason's discontinued Mango and Ginger Green Tea, and this was actually pretty close to what I remember that tea tasting like! I found this tea at Modica Market in Seaside, Fla., but it's easily available online. Only after I bought it did I discover it is made by Celestial Seasonings, which I found surprising. Next find: Revolution Tea. Ah, now there's a pleasant tea memory. It comes (or at least "came") in these cute, tiny little individual boxes. 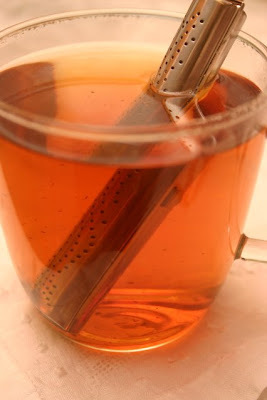 Several years ago, my mom found a non-tea-drinking sales clerk who sold her a whole case of the tea for what, we later learned, was supposed to be the price of one teabag. I was drinking Revolution Tea for a longgggg time after that. So when I occasionally buy the tea now, I figure I owe them. 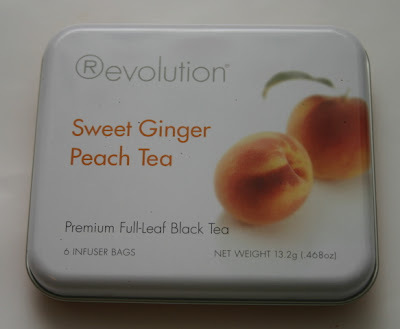 Ginger Peach is always a favorite flavor, and now it comes in this great little tin of six infuser teabags. This is perfect for travel. 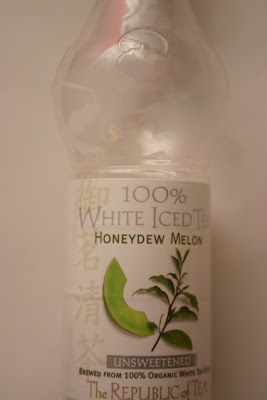 This Republic of Tea Honeydew Melon Tea was kind of so-so, but it's the bottle that caught my eye. I've had their bottled teas before, but I must confess I never noticed the embossed teapot design on the bottle before. I'm saving this for some as-yet-unknown craft purpose. If nothing else, it'll be good for holding those tiny, perfect seashells picked up on Seagrove Beach one morning. Isn't God nice to give us totally free craft supplies like that? I can get excited about the simplest of things. This week, I was grateful God made all those wonderful shades of cream and beige. And finally, I can't even remember which Alabama convenience store surprised me by selling this Twist Organics Mandarin White Tea, but boy, do I hope I find it again somewhere here in Georgia. This is a non-carbonated tea drink flavored with organic agave nectar and natural organic mandarin white tea flavor. It's got just 2 grams of sugar per serving, with about 2.5 servings in the bottle. I got two servings out of it, and the clean, orange flavor was so much better than wolfing down a diet Coke on the road. If you're traveling soon, please report on what new teas you find! "Tea is always a ceremony. For this reason, it must be approached in a certain way. 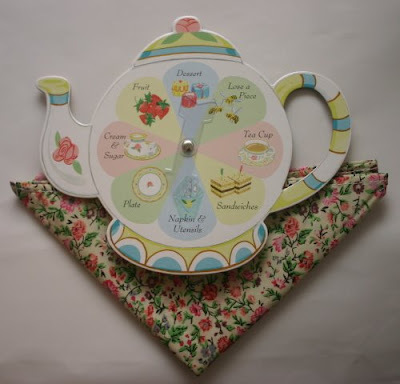 Whether you're preparing a cup of tea simply because you're tired and need a lift or planning a tea party in the garden, there are certain things that are constants. 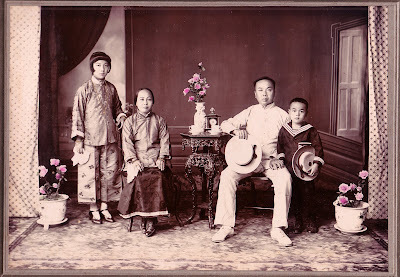 The surroundings of the tea ceremony are almost as important as the tea itself." 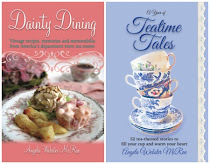 -- Alexandra Stoddard, in "Alexandra Stoddard's Tea Celebrations"
"It's not the tea ... that makes teatime special, it's the spirit of the tea party. It's what happens when women or men or children make a place in their life for the rituals of sharing. It's what happens when we bother with the little extras that feed the soul and nurture the senses and make space for unhurried conversation. And when that happens, it doesn't really matter what fills the cups or holds the liquid. It really isn't the tea. 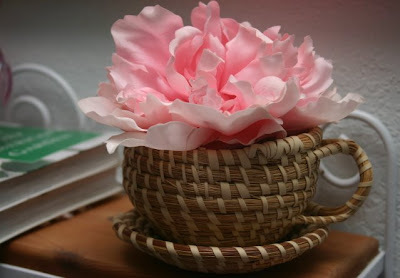 It's the spirit of the tea party." -- Emilie Barnes, "If Teacups Could Talk"
Do you miss the department stores you once found in every big city? I do. As a young lady, I enjoyed going with my mother to Atlanta to visit stores such as Davison's (later it became Macy's) and Rich's in order to buy "nice" clothes and "nice" shoes and visit the fine china department or perhaps (at Rich's) pick up a coconut cake from the bakery. Sadly, these once grand old stores declined, Rich's and Macy's merged, Lord & Taylor closed its doors, and in my neck of the woods, at least, what passes for "nice" today is Saks Fifth Avenue and Bloomingdale's. In my mind, these places aren't really elegant anymore, they're just expensive. It's Paris Hilton instead of Elizabeth Taylor. I still visit a department store occasionally, but rarely do I get the same rush I did from the classic stores of my youth. 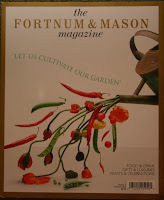 Then, in 2004, I went to London and walked in Fortnum & Mason. Now THAT, I submit to you, is a department store. And when I found out last year they were coming out with a magazine I was delighted. 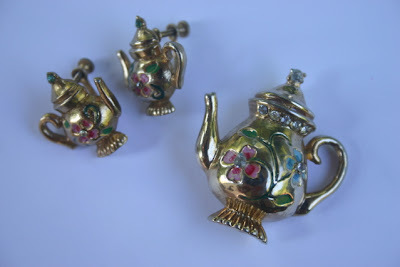 After taking tea there (the only time I've eaten gold leaf, I believe), shopping for teas in the food hall, and browsing the silver wares on sale, I was in love. Everything about this store appealed to me, and I wish I could have been there last year when the store was remodeled in honor of its 300th (!) anniversary to see what they've accomplished now. That same feeling of wow-ness I got from entering the store comes to me from the pages of this magazine. 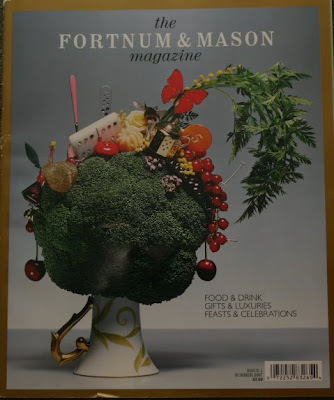 The first issue, at top, I begged from a publicist at the U.S. Fortnum & Mason office. The second issue, shown here, I found on eBay. 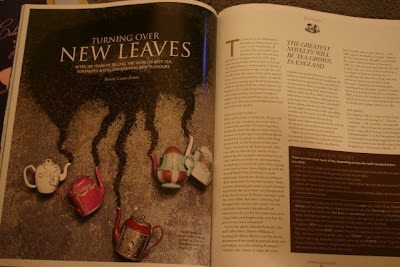 By this time I knew I *had* to have a subscription, because every issue was featuring articles on tea, and I had to read them. I couldn't get the online order form to work (overseas subscriptions ARE available, no matter what the computer tells you), so I e-mailed asking for help subscribing. Soon, my voicemail had a message from a man with a beautiful accent, telling me he was so sorry he had missed me and would try again shortly to reach me. None of that call-us-between-9-and-5 business (or some operator in India) for these good people. I was impressed F&M made it *their* business to help me. And now, a few samples. Here is one of the neatest "tea graphics" I have ever seen. 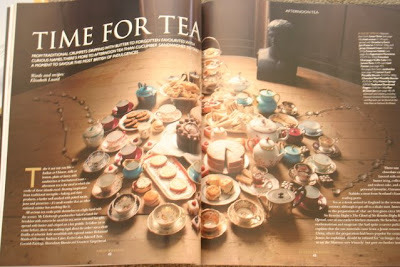 Can you tell that this spread is teapot-shaped, and the handle and spout are made of teaspoons? 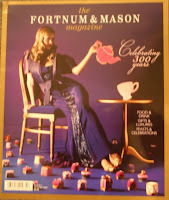 And here's another article talking about Fortnum & Mason's ongoing quest for new tea flavors (or "flavours," as they say). 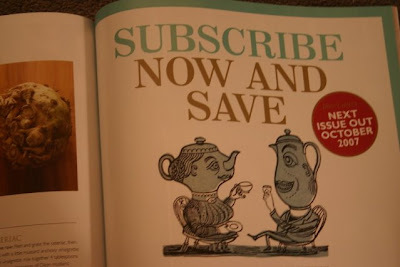 Even this advertisement for subscriptions is just charming. If you want to preview issue #4, which is just out and should land in my mailbox soon, go here straightaway, and you can also subscribe if you are so inclined. Have a good day, Madam! For scheduling reasons, my husband and I aren't taking our big hunks of vacation time until the fall, so I've been using up some of my three weeks piecemeal. The magazine's schedule pretty much dictates when I can and can't take a day off, and yesterday afternoon was a fine one to take off, so I spent it with my friend Liz at her new shop in Senoia. I enjoy seeing the customers come in loving the store and chatting up the things they like (no tea, alas, although I'll certainly try to steer her in that direction!). But yesterday I was there when a lady stopped by who'd called Liz about possibly selling her some things to re-sell in the shop. 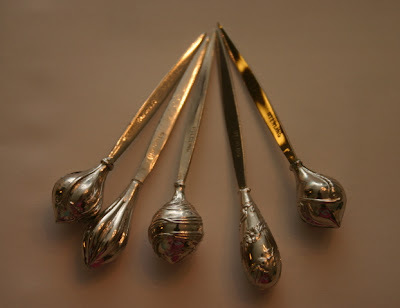 And that's how I ended up coming home with some sterling silver sugar tongs. I've never had a close friend open a new shop, so I don't really know the proper "etiquette" here when an in-the-shop transaction is underway. I didn't want to stick my nose in her business, so I just sat down at a table and read a magazine, trying not to eavesdrop. But then I heard the words "sugar tongs" and my ears perked up. I was *dying* to turn around and look, but I didn't. Then, bless her, I heard my friend politely say that although this was not the sort of thing she's carrying in her shop, "my friend Angela here might be interested." That's all the invitation I needed! 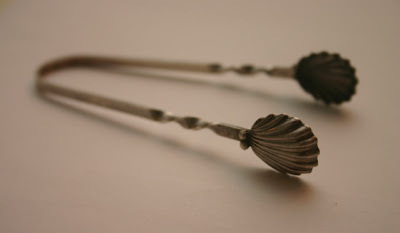 I have only a few sugar tongs, all silverplated, and these before me were small and dainty and sterling, and just $15. 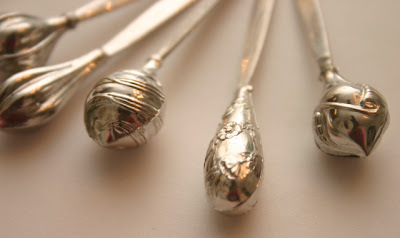 The kind visitor, Barbara, formerly had an antique shop in Boston, and had other sugar tongs (including another set just like mine) and various glass and silver pieces I would love to have on my wish list over time. We swapped e-mail addresses, and I sure hope to hear she's opened a booth at one of the local antique malls. Yesterday I found a new variety of Lipton tea and had to get a box to try. 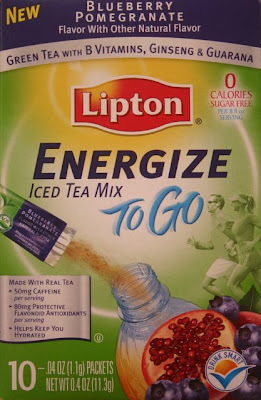 It's Blueberry Pomegranate Energize Iced Tea Mix To Go. Have you ever noticed certain flavors seem to be in vogue at times? Pomegranate seems to be the celebrity flavor these days, and I happen to like it. Well, this tea was pleasant tasting, but only in a generic-berry-flavor kind of way. 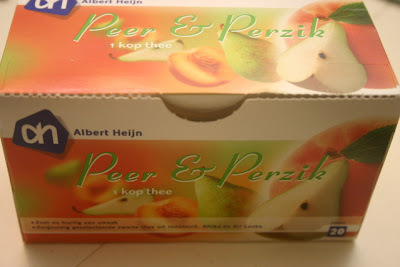 Didn't taste the pomegranate, didn't feel "energized" by the caffeine. This was fine, but I probably won't buy it again. On the hot tea front, what I've been drinking at the office this week is Davidson's French Vanilla Tea with Honey, which I was surprised to find at T.J. Maxx. 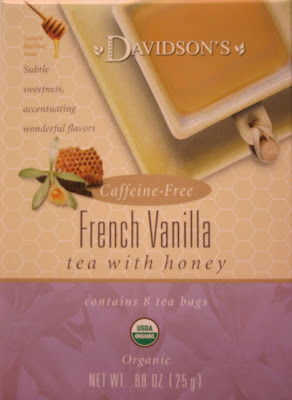 I love the flavor of vanilla, and this tea's addition of a honey flavor made this a particularly enjoyable, smooth blend. 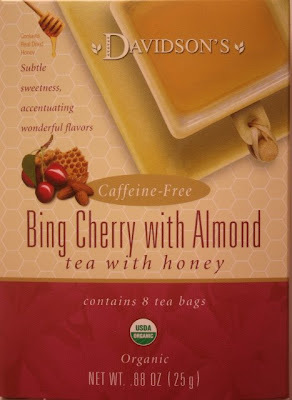 The other new tea I've tried is Davidson's Bing Cherry with Almond, also flavored with honey, which is just as delicious as the French Vanilla. 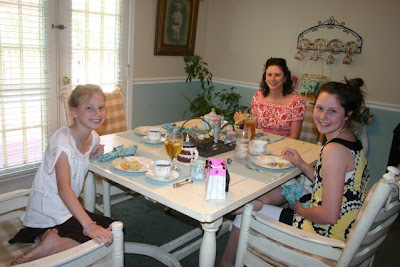 I've enjoyed Davidson's teas ever since a friend introduced me to their "dessert teas" some years ago. And since I haven't asked in a while ... have YOU tried a new tea lately that you'd be willing to share with us? It's been said that one definition of insanity is this: "Doing the same thing over and over again and expecting different results." I've often heard this quote applied to single women who keep dating the same sad fellow over and over again and are shocked when the relationship doesn't turn out well. I would say it could also apply to tea lovers who keep buying metal infusers with large holes in them and then are shocked when a few tea leaves slip out. Perhaps we should start calling it "Tea J. Maxx," because this store is definitely a beloved one for us tea lovers. On Saturday, my mom, aunt and I were at the one in Anniston, Ala., when I came across a Scrabble coffee mug. Now being a word person, I love the game Scrabble, so I was amused to see words related to coffee (java, espresso, etc.) 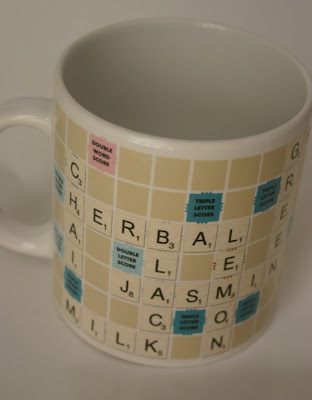 spelled out in Scrabble letters on the mug. I wondered if the language on the mug would extend to tea, but it did not. 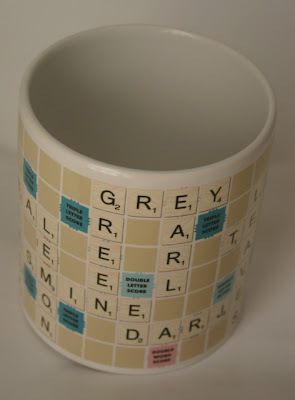 With great sorrow, this Scrabble lover placed the mug back on the shelf and started to walk away. 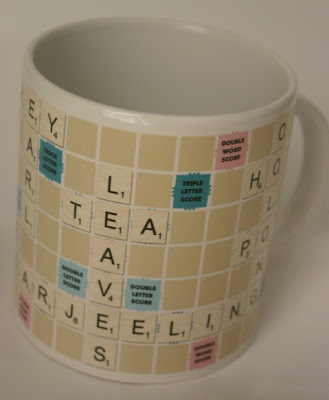 But it was a crowded shelf, there were other Scrabble mugs about five rows back, and I looked up *under* the clear glass shelf (one advantage of being short) and spotted these letters: "EELING." Now I don't know about you, but I do not know any coffee terms that end in "EELING," but "DARJEELING" sure does! So there I go, standing on tiptoe, rearranging the shelf at T.J. Maxx (why do they insist on putting these little items on HIGH shelves, I ask you), but finally I got to the back row and found this wonderful tea mug! Since I've been using the same tea mug at work for more than a year, I was happy to find a new one, and for just $3.99. Tuesday was my and Alex's second anniversary, and since it's a few more weeks until we get to take our official "anniversary trip" to the beach, he told me to plan a day of whatever I wanted to do, so I did! We both took Tuesday off and headed north. I hadn't realized the towns of Blue Ridge, Young Harris and Helen were so close together. We (OK, "I") spied a quilt shop in Blue Ridge, so he went in search of real estate brochures while I checked out Mountain Holly Quilters. Having fallen in love with our own independent quilt shop in Newnan, Heritage Quilts and Fabrics, I've learned to appreciate the high-quality, gorgeous fabrics you can find only at quilt shops. 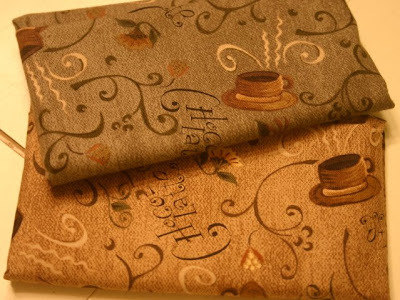 Thinking ahead to fall projects and fall color palettes, I got these two fat quarters of a "Choco-latte" print. 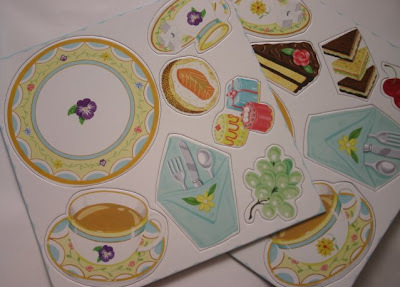 I figure I can "fussy cut" the teacups out to use in pieced blocks or applique projects. When we realized how close we were to "Alpine Helen," we headed there. If you're not from Georgia, I hope you've at least heard of Helen. It's designed to look like a small German village, very famous for its Oktoberfest celebrations each year. I haven't been to Helen in years, so it was especially nice to be there on a low-traffic day and look around. 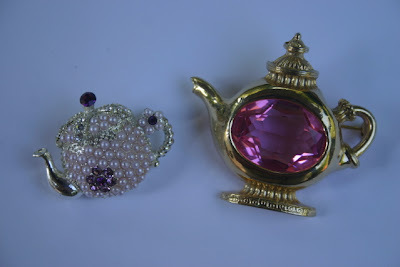 Not long ago, I shared a new teapot pin I had found. 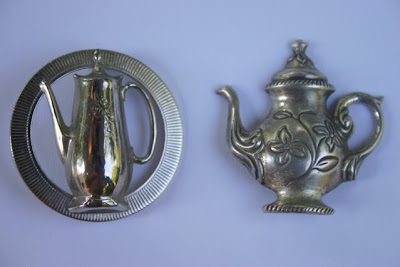 It was an interesting design of a silver teapot on a shelf, and since some of you liked it I thought you might enjoy seeing some of the other teapot pins I've collected as well. These come from the usual sources (antique malls, eBay, Etsy), and I've been pleasantly surprised at how inexpensive these are to find, some for as little as $3, and so far none more than $12, and that one was sterling silver. 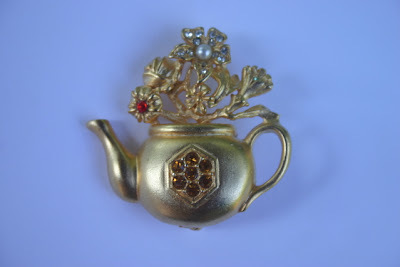 This gold one blooming with pearl and rhinestone flowers is one of my favorites. These two silver ones are rather classic looking, I think, and I can see these popping up on sweaters a lot this fall and winter. 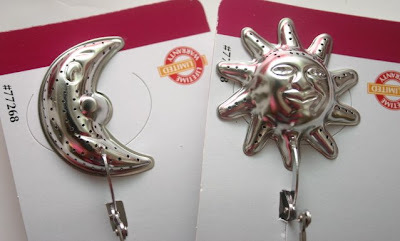 The one on the right is the sterling silver one I found on Etsy, but I've seen this exact pin on eBay a lot lately. The circular one has a sort of sixties vibe, and I've worn it on a short sleeved, lightweight pink sweater this summer. These are both rather gaudy, but I like them anyway. Think pink! 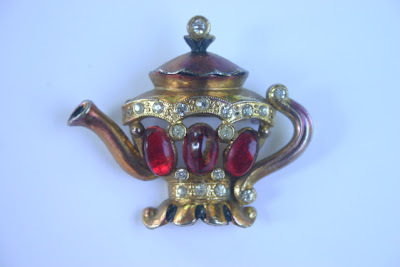 Another favorite is this vintage pin with red cabochons and clear rhinestones. Some of the gold has a purplish cast to it. I don't know if that's the original finish or if it's some sort of tarnish, but I like it anyway. And finally, I already had these earrings when I found the matching pin. A cute set, no? Really, it's not like I'm always *looking* for tea things, it's just that I so very often come upon them. Like the other night. 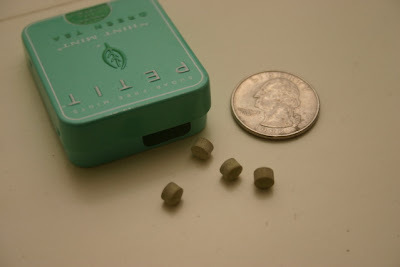 I was checking out at Books A Million and there on the counter were these tiny little tins of Green Tea Hint Mints. 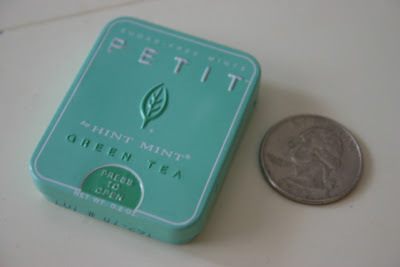 So tiny, in fact, I had to wonder if these were worth 99 cents, but when I saw the words "Green Tea" I was sold. Astonishingly enough, these tiny, tiny mints pack a lot of punch and are quite flavorful. The mints come in other flavors, and I may have to try them all. But for now I am quite content to have such a thoroughly compact tin of mints to carry in my purse. You actually have to press on the tin to make the opening appear, and after staring at this a while it struck me that I was having a flashback to the days when Bayer Aspirin came in those tiny little travel-sized tins. My only question now is, what craft can I use this for once it's empty?